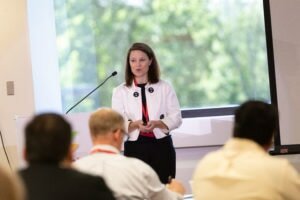 The Children’s Cancer Foundation, Inc. hosted the third annual Research Symposium, “Today’s Research to Tomorrow’s Clinical Trials” on Wednesday, June 6, 2018. 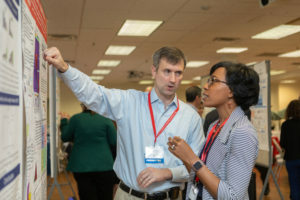 Launched in 2016 and the brainchild of CCF Scientific Advisory Board Chair Jeffrey Toretsky, M.D., of Georgetown Lombardi, the CCF Research Symposium is based on the belief that small local research dialogue will go a long way toward substantial research collaboration. 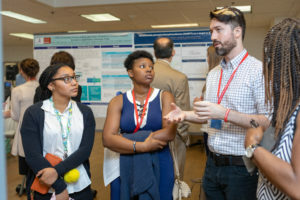 Regional experts, advocates, and trainees share their research and continue to advance the treatment of childhood cancer. 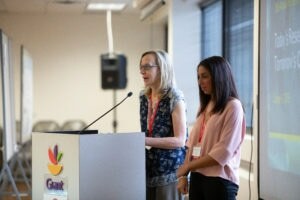 The one-day event was attended by over 80 participants and was generously hosted by Giant Food. 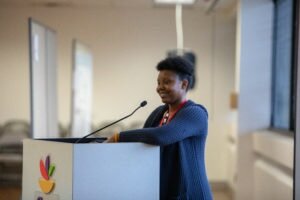 CCF gratefully acknowledges the support of The Kahlert Foundation and all volunteers who contributed to an incredible day of learning. 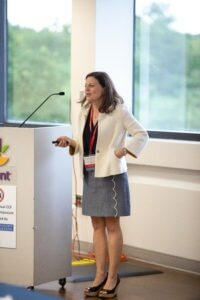 Attendees heard from Keynote speaker, Dr. Catherine Bollard, of Children’s National, who shared her journey as a groundbreaking researcher in immunotherapy and presented its greater potential for treating childhood cancers. 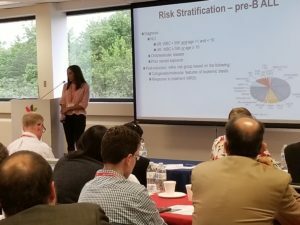 The 2017 Giant Food Next Gen research awardee, Dr. Haneen Shalabi, of the National Cancer Institute at NIH, presented the progress of her CCF-funded research on CAR-T cell therapy for leukemia patients. Review the CCF You Tube Channel’s playlist of all published presentations from the day here. 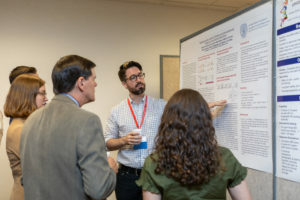 The greatest opportunity for research exchange and discussion was offered during the mid-day poster sessions, where participants talked with more than 30 poster presenters from area research institutions. 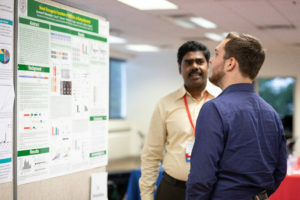 A plan for new collaboration and a discussion of similar hurdles faced in one’s research were two highlights from this session. 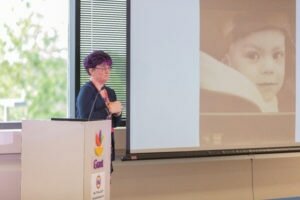 The most emotional part of the day came from those directly impacted by pediatric cancer, who shared their journeys – Alisha Bartels, who lost her son, John Eric, to neuroblastoma, and Kalani Looper, who survived her battle with AML as a teen. 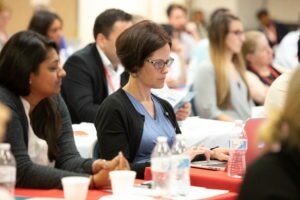 CCF is grateful to these courageous and dedicated individuals that participated in the symposium and looks forward to following the incredible advancements that they make with their research, trials, treatments, and advocacy. 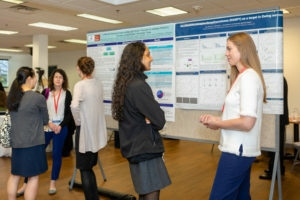 The 4th Annual CCF Research Symposium is tentatively scheduled for June 5, 2019. 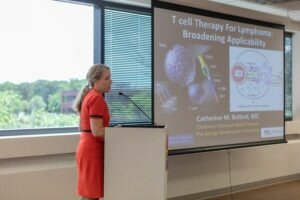 Dr. Catherine Bollard, Children’s National, presents an overview of immunotherapy and its continued potential in treating some children’s cancers. 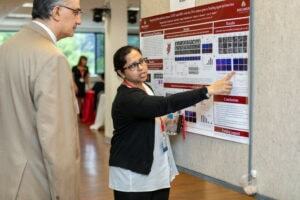 Dr. Haneen Shalabi, National Cancer Institute/NIH, presents her CAR-T Cell Therapy research. Brian Rood, M.D. 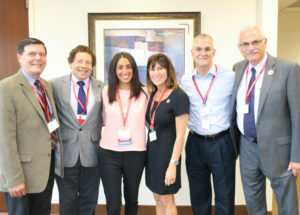 of Children’s National, and Sadhana Jackson, M.D. of the National Cancer Institute, discuss findings from Dr. Rood’s latest research. Alisha Bartels shares her story of her son’s fight with neuroblastoma. Holly Meany, M.D. 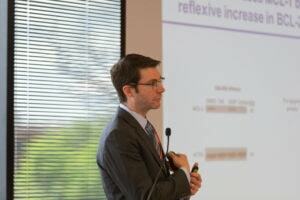 offers a clinical overview about Neuroblastoma, before researchers present their specific research. 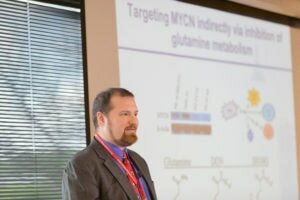 2016 CCF Giant Food Next Gen Awardee Dr. Jeffrey Rubens updates the audience of the last year’s work on AT/RT, the most common brain cancer in infants and toddlers. 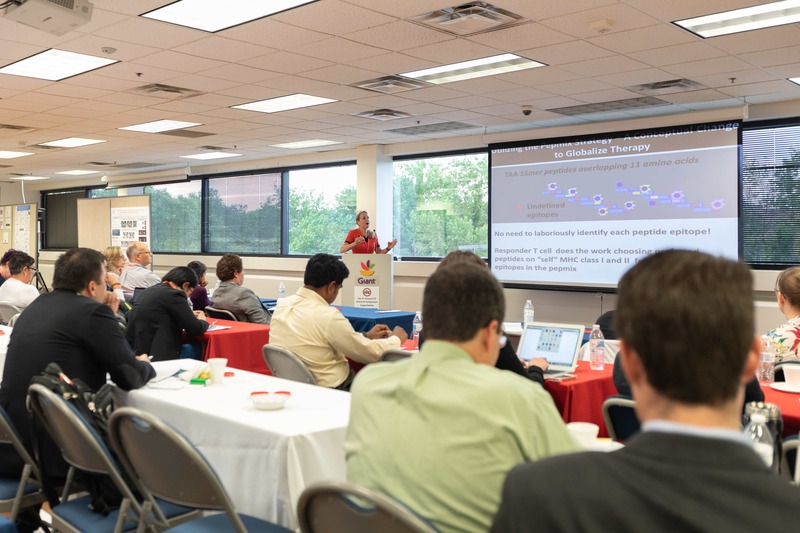 2016 CCF Research Grant Awardee Dr. Christine Pratilas, takes notes from presentations. 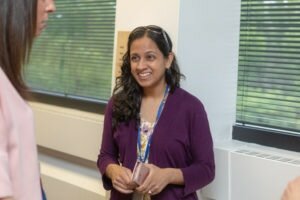 2014 CCF Giant Food Next Gen recipient Dr. Nirali Shaw, of the National Cancer Institute, attends in support of her colleagues presenting. AML Survivor Kalani Looper shares her inspiring journey of determination and bravery.